People who love to take photos but can’t spend much money to purchase expensive digital camera can utilize modern Smartphones to fulfill their pleasure. Especially, the android mobile users can make use of the best photo apps available in Google’s App Store, as android takes more share in the mobile market. There are numerous apps accessible – both paid and free, which are helpful in taking photos, editing them and adding effects to the original. 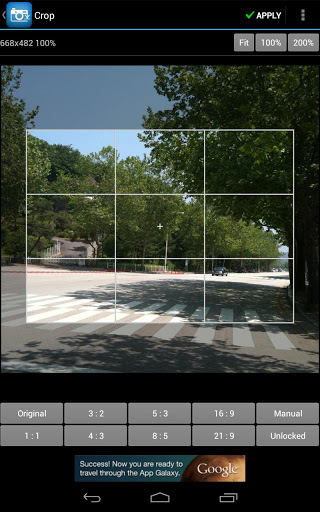 I give you the five best android apps in photography group which are top in June, 2013. Hope you find the following apps useful and handy. With PicsArt, you could be a great artist if you take some good snaps using your Smartphone. 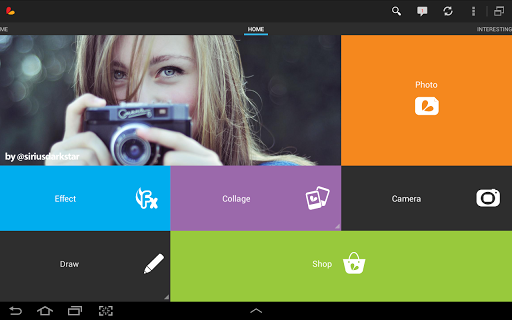 It is the most popular photo editor app in Google Store and most importantly it is absolutely free. It is an ultimate and powerful free photo editing app, also used to create photo collage, draw using built-in tools, and has picture art network. The major tools that are included in PicsArt are Collage Maker, Photo Editor, Effects, Photo Camera, Drawing Tool, and Artists Network. The Collage Maker lets you to create awesome collages with various photo grid templates. The Photo Editor offers tons of editing features such as frames, borders, text effects, clipart graphics, crop, rotate, color adjust and many more. The overwhelming Photo Effects such as stenciler, cartoonizer, vintage, HDR, pencil, etc which you feel like an artist. PicsArt Photo Camera provides you to capture photos, preview them, and apply photo effects which increase your regular camera experience. With Drawing Tool, you can have artistic brushes, text styles, rearrange image layers, etc. The Artists Network allows you to share your creative images that are edited via SMS and Email. You can participate in free weekly photo contests for drawing artists, graphical designers, and photo editors. 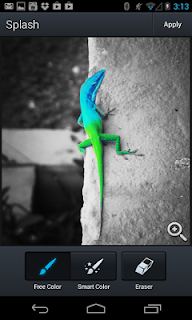 Aviary is an excellent photo editor reviewed by top websites and recommended by many experts. It’s simple yet elegant interface is intuitive for editing photos. It can many photo editing features such as "One-tap" Auto Enhance, photo effects, frames, color balance, crop, color temperature, sharpen, blur and many more. It offers cosmetic tools like fixing red-eye, remove blemishes, and whiten teeth. You could create your own memes (identical ones) easily. It offers 12 purchasable effect packs, high resolution output, drag-and-drop customization, and other bonus tools which is an advantage to many photo lovers. Download Photo Editor by Aviary for free from Google App Store. Pixlr Express is a free photo editor from the makers of Pixlr-o-matic, which happens to be one of the finest photography tools available in the Android app store. 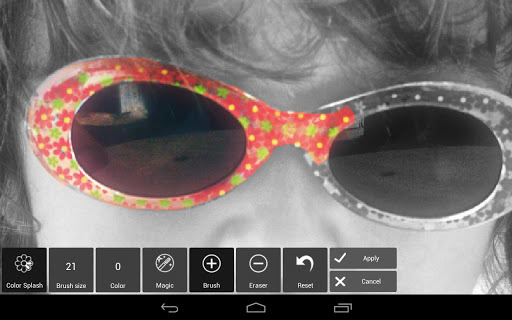 Using Pixlr Express, you can crop, re-size, remove red-eye, and apply more than 600 effects to your photos. The ‘Auto Fix’ feature lets you to fix balance out colors, adjust dark photos, and poor lighting conditions with just one click. You can share photos with your friends directly from the app itself through Facebook, Instagram, Twitter or other sharing apps. Download it for free from Google App Store. Here comes the best camera application for portraits. 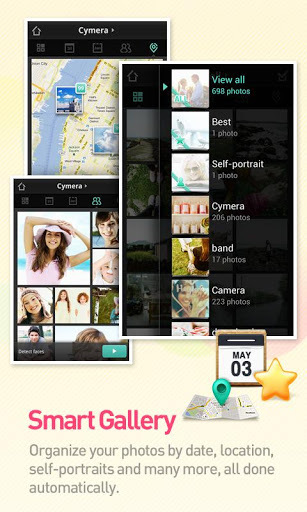 Cymera is one of the first photo editing apps created and has won many awards with its powerful capturing and editing tools. It offers a massive range of lenses and shooting modes and shooting modes with face detection technology unlike others. It includes over 800 decoration options along with collage effects. Cymera’s features include powerful camera, hand-picked filers and borders, amazing beautifying effects, storytelling collage, fun decorations, social sharing, and complementary editing functions such as cropping, rotation, auto-level and many more. It is one of the few photo editors which offers pinch-to-zoom interface which makes it a comprehensive tool for editing photos. Photo Editor by IUDesk is a simple and easy application for photo editing that includes all the tools and options which the top photo editors have. You can save the editing photos to your gallery and share them easily on Facebook, Twitter, Picasa, E-mail, or any social website.